Monday August 14, 2017: Monica fumes over Olivia's blunder, Dante gets a lead on Sonny's shooting, Sam struggles with what she did, and Hayden goes missing. At GH, Jason sits with Sam and continues to urge her to move on from shooting Sonny, but she can’t shake the memories. She recalls Julian visiting her in the hospital, which upsets Jason. Sam is puzzled because she has memories of visiting Julian and asking for his advice, but Julian tried to insist the conversation never happened. Alexis drops by to visit Sam, and Jason decides to leave them to talk. Alexis sympathizes with her daughter and her condition, and while alcoholism isn’t the same thing, she knows what it feels like to be out of control. Sam questions her mother about the trial. Alexis responds that Julian’s trial is currently in recess, but she did testify to the truth, which is important. Sam agrees that it is important to tell the truth. Scott drops by Julian’s place to let him know there is no court today or tomorrow. The Assistant D.A. claims he has another case he’s working, but Scott isn’t sure and is worried that he has something up his sleeve. After Scott leaves, Jason drops by to question Julian about his visit with Sam. 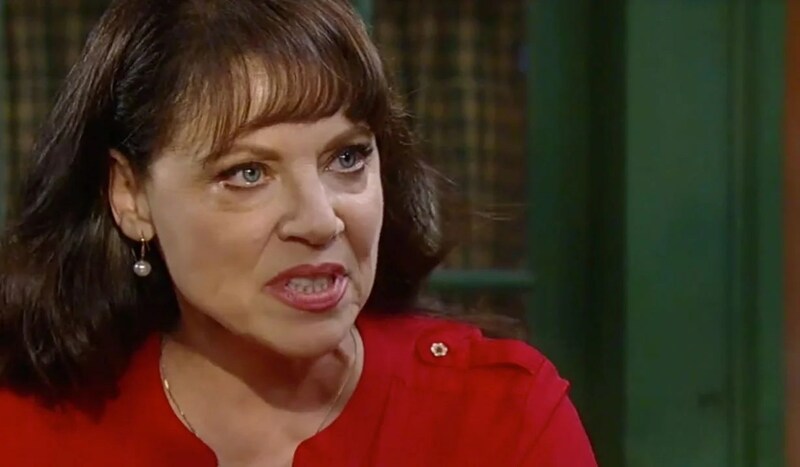 Julian admits that Sam came to see him and feared that Sonny was going to take Jason away from her again, so he told her the only thing she could do was to get rid of Sonny. He also informs Jason about the odd conversation Sam had with Ava the other day, and that Sam indicated Sonny would pay for Ava’s burns. Jason warns Julian to keep this to himself. Michael visits his father at home, where Sonny is recuperating. He worries that someone shot Sonny because he was planning to get out of the business, and that his father may be planning to retaliate. Sonny assures Michael that he has no plans to go after who shot him. At the PCPD, Dante and Nathan catch a break when a third gun is found in a dumpster near the construction site. They run a ballistics report and the gun in a match for the bullet that is was pulled from Sonny’s leg. Liz arrives at the Quartermaine mansion for Finn and Hayden’s wedding, where Ned greets her. Suddenly, Monica storms in furious because cook is nowhere to be found, isn’t answering her calls and no food has been prepared. Olivia admits to firing her, which sends Monica through the roof. Ned tries to defend his wife, but Monica can’t believe someone in her house would go behind her back in such a way. Michael appears to discuss something troubling with Monica, who can’t deal with more bad news. Michael has discovered an account was set up by Rachel Berlin to funnel money from General Hospital, but the money was returned almost twenty-four hours later. Monica recognizes Rachel as Hayden’s real name, and doesn’t understand why she would do this. They discuss the rushed wedding, and Finn and Hayden’s supposed honeymoon to Zanzibar. Monica needs answers. Obrecht and Jared talk outside of Kelly’s. Jared is pleased he is getting the money he deserves, and thinks Obrecht must be happy that Rachel is suffering. Obrecht admits her real target is Hamilton Finn, but Hayden’s misery is a nice added bonus. She can’t wait to see how Finn reacts to the truth about Hayden, and wonders if he’ll turn to drugs again. Curtis finds Finn in the park and thinks he should be getting ready for his wedding. Finn opens up to Curtis about his fight with Hayden after he learned she embezzled from GH. Finn doesn’t even know where they stand. Curtis suggests Finn go to her and straighten things out if he loves her. Later, Jared strolls through the park and says, “Time’s up!” He checks his phone and fumes that the account Hayden set up to pay him has been closed. Finn arrives at the Quartermaine mansion with Curtis to see Hayden. He knows it is bad luck to see the bride before the wedding, but he must speak with her. Monica says a lot of them need to speak with her. Liz decides to let Hayden know he is here and heads upstairs. She quickly returns and reveals Hayden is missing. Monica asks if she left a note. Liz responds no, but that she did leave something behind. She produces Finn’s engagement ring. Dante arrives at Sonny’s and grills his father about the shooting. Sonny feels they’ve been over this, but Dante says they have a third gun now, the one that shot him. Sonny stays quiet. Dante gets a call and tells his father he knows who purchased the gun. Jason heads to the station and overhears some cops discussing the new evidence. One cop asks the other to enter it into lock-up for him. Dante questions Nelle about the bullet casing. Joss is asked on a date by Oscar. Carly confronts Sam over what she did to Sonny.